Drinking cup; silver-gilt; cylindrical body with etched design of cavalry skirmish; sign of Scorpio in the sky; lower part with oval bosses; short stem with recumbent man and woman in frames; foot with three human masks; inscribed. Origin: Nuremberg; late 16th century; mark of Caspar Beutmüller I (master 1585, died 1618). Marks: These marks are punched close together near the centre of the underside of the bowl, and are visible at the end of the short stem. (i) Assay mark for Nuremberg, 1550-1650 (R3 3759). (ii) The three labels within a shield punch of Caspar Beutmüller I (R3 4046B). Commentary: The maker, Caspar Beutmüller the Elder, came to Nuremberg from Venice; his son, Caspar Beutmüller II, was also a goldsmith of Nuremberg (master 1612, died 1632). The theme of battle scenes, particularly cavalry skirmishes, in the classical manner was developed in Italy, particularly in late quattrocento Renaissance sculpture -probably the finest early example being the famous bronze relief (c.1485) by Bertoldo, the teacher of Michelangelo, which Bertoldo based on the much damaged Roman original, still to be seen in Pisa. Bertoldo's relief (Museo Nazionale, Palazzo del Bargello, Florence; 43 x 99 cm) demonstrates his profound understanding of the antique. Among the early gifted Italian engravers who helped to popularise this subject was Agostino de’Musei, known as Agostino Veneziano (fl. 1514-36), an artist working in Rome in the circle of Marcantonio Raimondi. Agostino's engraving of ‘Scipio in Battle’ or ‘La Bataille au coutelas’, as Bartsch refers to it (B.XIV. 171. 212), was perhaps the most widely circulated, but there were several other close variants, including a reverse print of ‘Scipio in Battle’; some of these variants Bartsch attributes to Marco Dente (died 1527) and other pupils. Once firmly established in the repertoire of Renaissance pictorial subjects, the classical cavalry skirmish became fashionable north of the Alps and, indeed, remained in fashion throughout the sixteenth century in most branches of the arts, especially among those patronised by the warring courts of France and Germany. Adapted in innumerable ways, the subject frequently appears on arms and armour, on tapestries and, in miniature, on jewellery and engraved gems, but, perhaps more surprisingly, even in religious paintings by German artists, such as Heinrich Vogtherr the Elder of Strasburg, who in 1542 depicted in this new Italian classical manner the battle between the Israelites and the army of Amalek (Exodus 17, vv. 10-16) in which Moses had to keep his arms upraised, aided by Aaron and Hur on either side; the drawing is preserved in the Department of Prints and Drawings, British Museum (see H. Geissler, Zeichnung und Zeichnen, ‘Die Renaissance im Deutschen Südwesten’ exh. cat.. Heidelberg Castle, Badisches Landesmuseum, Karlsruhe, 1986, p. 304, fig. E. 3). The widespread appeal of this type of battle scene in the antique style ensured that it was disseminated along with the published sets of engravings by Nuremberg masters such as Virgil Solis and Matthias Zündt, who during the second half of the sixteenth century were largely responsible for the spread of these new ideas throughout the German-speaking parts of Europe and the Baltic countries. On this drinking-cup Caspar Beutmüller the Elder has filled most of the frieze with the densely packed scene of combat but, in the preferred idiom of the late sixteenth century, a panoramic view of the landscape setting is subtly indicated, especially beneath the Sign of the Zodiac. 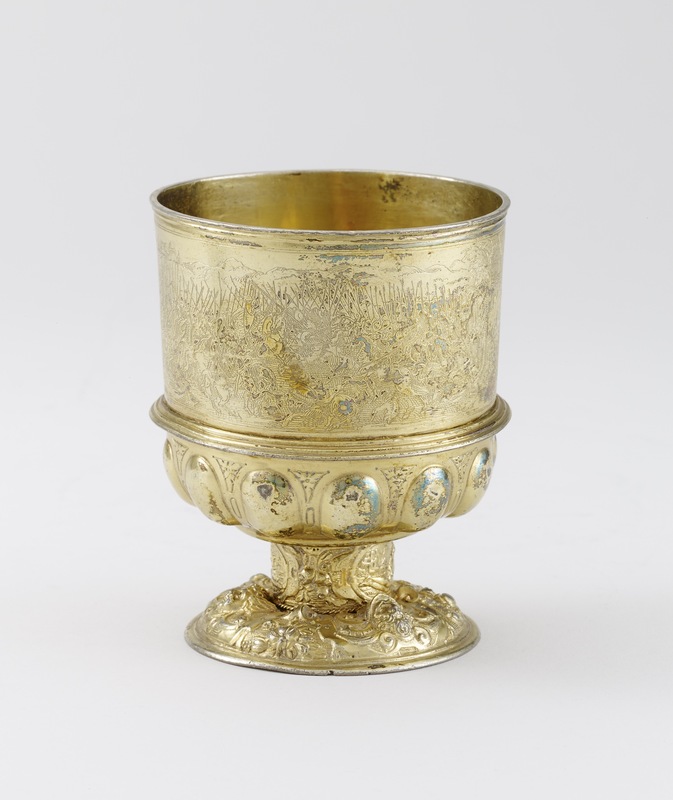 The cup belongs to a set of twelve, one for each Sign of the Zodiac, and although such sets of stacking goblets are listed in German records since the fourteenth century, the earliest extant examples are no older than the end of the fifteenth century. Few complete sets are known except from contemporary illustrations, such as the full-page coloured drawing in the manuscript known as the ‘Goldenes Buch der Schneiderzunft’ of Strasburg, begun in 1598 and preserved in the Bibliothèque Humaniste (MS 142), Séléstat. It depicts the fifteen beakers stacked together to form a most imposing entity, complete with a matching silver-gilt cover surmounted by a finial on which stands a Renaissance helmeted classical warrior holding a shield and a spear (see Kurras 1986, pp. 452-3, no. G. 30, col. pl.). The ‘Satzbecker’ is a peculiarly German idea, and one of the earliest well-documented sets to have survived is the famous Sickingen Beckers, a set of eight with a cover, each inscribed in Latin, the inscription ending: FRANCISCVS . DE . SICKINGEN . ME. FIERI . FECIT . 1519). They bear the punch-mark of the town of Speyer and the engraved coat-of-arms of Sickingen; they have been preserved in the collection of the Landgraves of Hesse and are now in the Hessisches Landesmuseum, Kassel (illustrated in C. Hernmarck, ‘The Art of the European Silversmith, 1430-1830’, 2 vols., Sotheby Parke Bernet Publications, London, 1977, p. 18, fig. 48). A design for a nest of twenty-five beakers, stacked together with an elaborate lid and embossed high foot, was recently found in the Herzog-August Library in Wolfenbüttel. It had been made for the Duke of Brunswick about 1590 - no doubt as a demonstration of virtuosity, for great precision would be required to fit twenty-five beakers together without their outer surfaces rubbing each other (Martin Angerer, Uber Nürnberger, Goldsmiedezeichmungen, in ‘Wenzel Jamnitzer und die Nürnberger Goldschmiedekunst 1500-1700’, exh. cat., Germanisches Nationalmuseum, Nuremberg, 1985, pp. 132-4, fig. 105). More frequently, the sets comprised either six or twelve beakers. Each beaker is made slightly narrower than its predecessor so that one will fit snugly into the next as the stack grows taller; each projecting applied ring rests on the rim of the cup below, and so the foot of each beaker is slightly above the bowl of the cup in which it is stacked. When the set is assembled together, the decorated bands above the applied ring of each cup are visible, arranged vertically adjacent, creating a tier-upon-tier effect of twelve friezes up the side of this tall 'standing-cup'. No doubt a further advantage was gained when travelling or during a military campaign, because the cups occupied the minimum of space in a travelling case. Often these stacking-cups are decorated in low relief with scenes representing the labours of the twelve months but, more unusually, as in this example by Caspar Beutmüller the Elder and WB.145 by Hans Beutmüller, they are decorated with a delicate form of engraving. It is so delicate that in both Read 1902 and Dalton 1927 it was stated to be the result of using the technique of etching, one of the standard methods of decorating armour that had been extremely popular, especially in Italy, since the later Middle Ages. The preferred method in Italy was to coat the metal with an acid-proof substance, such as wax or paint, through which the design could be scratched with a needle; when the mild acid - perhaps a warm vinegar - was applied, it attacked only the surfaces that had been exposed in drawing the design. The skill required when attempting a composition as complex as this cavalry skirmish would, understandably, have been greatly admired. However, the more obvious signs of acid etching are lacking, and consequently it has been decided to abandon the older published description and to propose that the decoration of the 'frieze' is lightly and finely engraved. Hugh Tait, 'Catalogue of the Waddesdon Bequest in the British Museum, II : The Silver Plate', British Museum, London, 1988, no. 38, figs. 200-203.Fine double cup with lobes, by same maker, was item 24 in Baron Carl Mayer Rothschild sale, Paris 1911, cat.24.